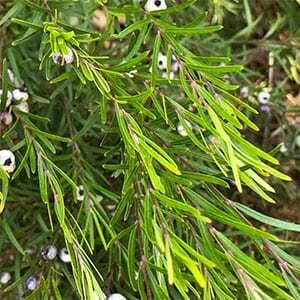 Austromyrtus tenuifolia is commonly known as the Narrow-leaf myrtle and also Midgenberry. It grows naturally in damp areas next to streams and moist depressions in forest areas. Although it is reasonably drought of dry soils for short periods it requires moisture to flower and fruit well. The flowers as a creamy white and small appearing in clusters. Following the flowers are small white berries that ripen in late summer. The foliage is attractive year round and Austromyrtus tenuifolia can be used as a low hedging plant. With regular pruning it makes a dense hardy hedge with the advantage of flowers as well as the berries. 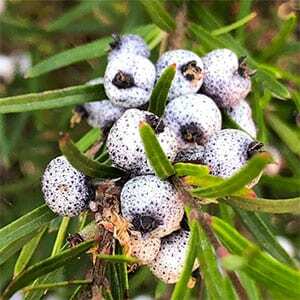 It is Austromyrtus dulcis that is more commonly used fro the fruits. Best grown in a moist yet well drained soil in a sunny position with some protection from the afternoon sun. This is a plant that can be lightly pruned after flowering to maintain a dense bushy growth habit. Common Name – Narrow-leaf myrtle. Height – To around 1 to 1.5 metres. Position – Sun, part sun to afternoon shade. Flowers – Creamy white, followed by small white berries marked with purple. Frost tolerant – Lights frost only.